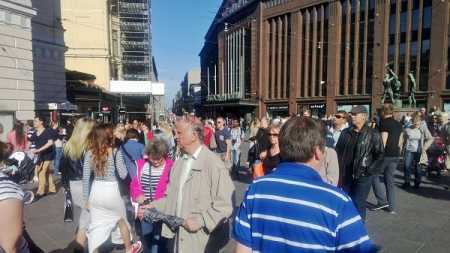 File picture of people at the Helsinki city centre area. FTimes Photo by Jasim Sarker. The population of Helsinki is growing fast, according to statistics from the City of Helsinki Urban Facts. The population increased by nearly 9,000 residents at the turn of this year from the previous year’s figure of almost 613,000. People have moved to the capital from elsewhere in the country and from abroad, enlarging the population, especially that of the residents over the age of 65 and children under school-age. The share of Swedish- and Sami-speaking population rose to nearly 13 per cent of Helsinki population. The largest foreign-speaking groups are Russians (16,000 people), Estonians (11,000), and Somalis (7,500). The Estonian-speaking population grew most compared to the rest of the foreign-speaking population. In January-May, the population of Helsinki increased by 3,400.